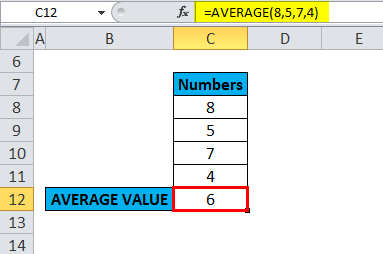 How To Use AVERAGE Function in Excel? According to the mathematical definition, Arithmetic mean or Average is calculated by adding numbers together, then dividing the total by how many numbers are being averaged. AVERAGE Function is very simple to use. 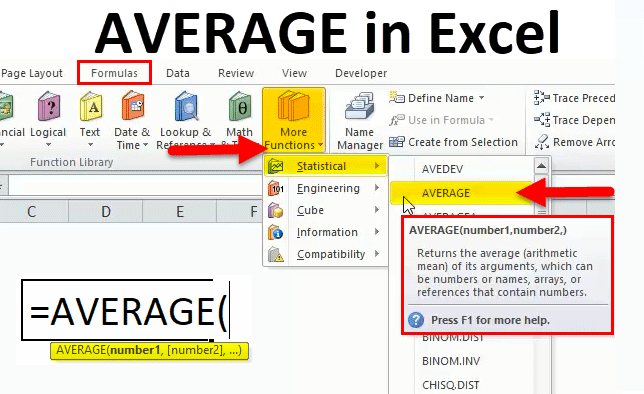 Let us now see how to use the AVERAGE function in Excel with the help of some examples. 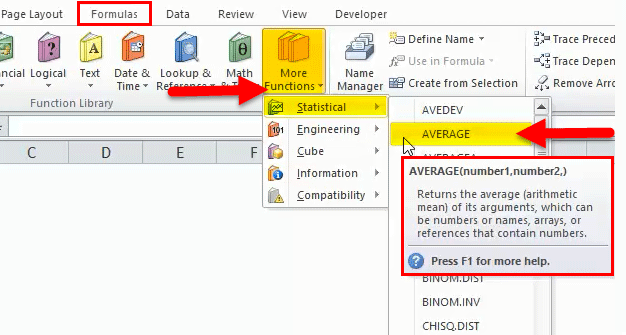 Click the insert function button (fx) under formula toolbar, a dialog box will appear, Type the keyword “AVERAGE” in the search for a function box, an AVERAGE function will appear in select a function box. Double click on an AVERAGE function. 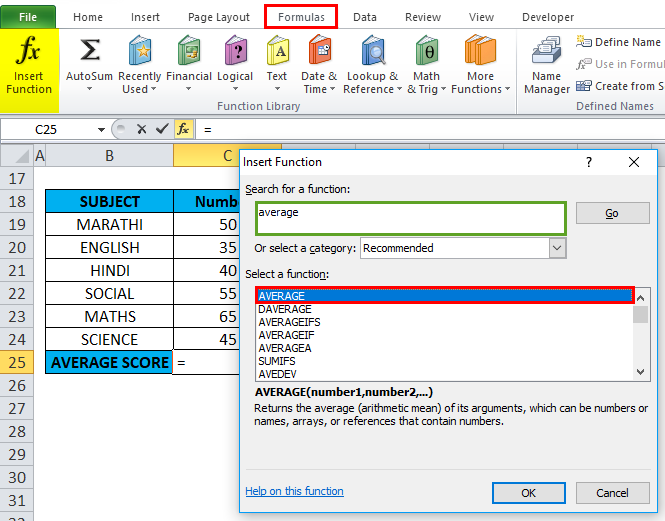 A dialog box appears where arguments for average function needs to be filled or entered i.e. 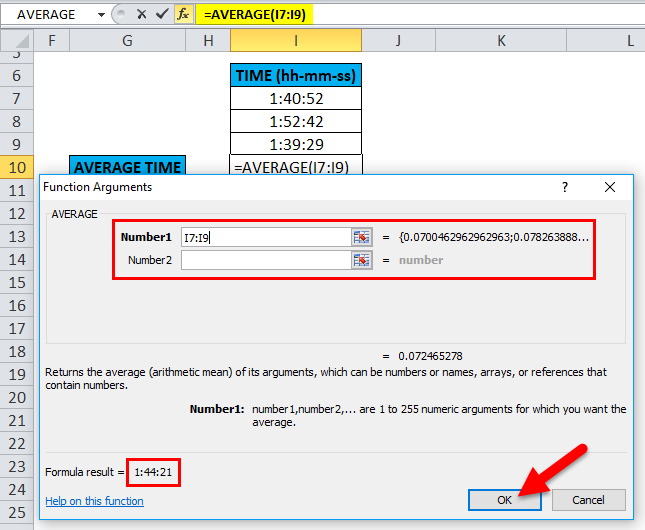 =Average (Number1, [Number 2]…) You can enter the numbers directly into the number arguments which are present in cells C8 TO C11. Click ok, after entering all the numbers. i.e. =AVERAGE(8,5,7,4) returns 6 as the result. 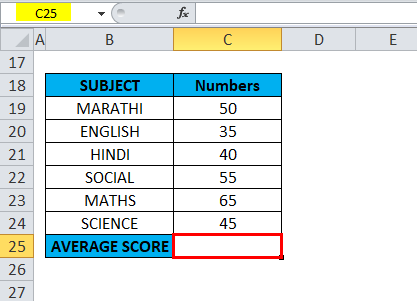 With the help of Average function, I need to find out average score of a student in that column range (C19 TO C24 is the column range). 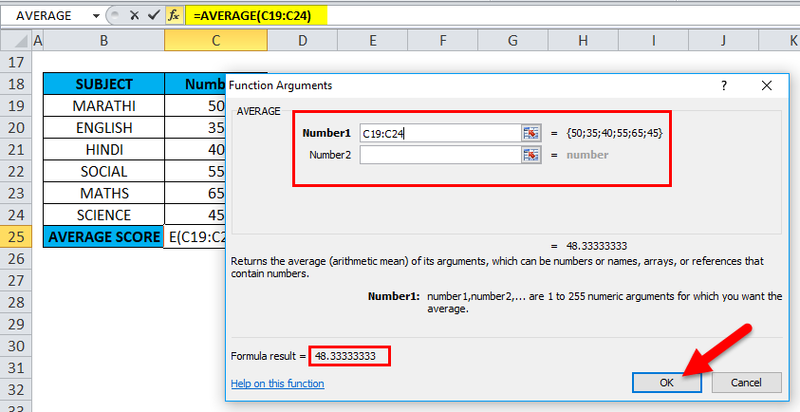 Let’s apply Average function in cell “C25”. 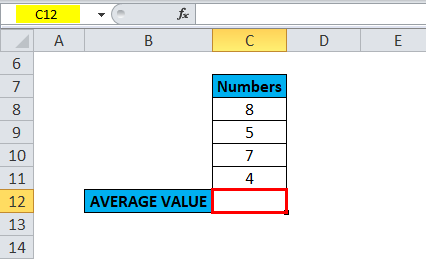 Select the cell “C25” where an Average function needs to be applied. 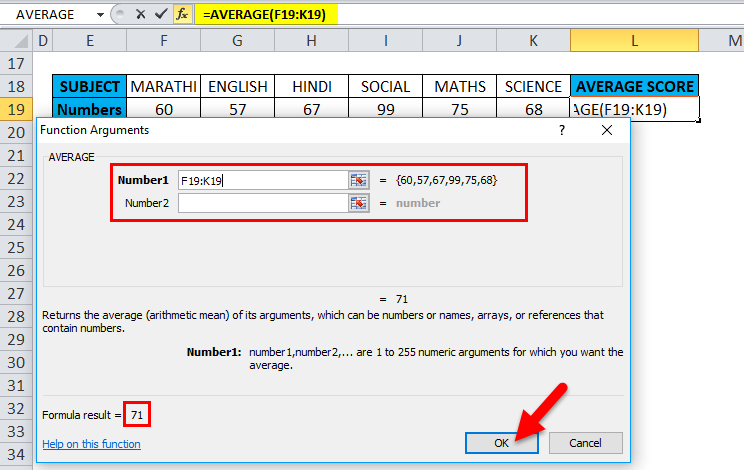 A dialog box appears where arguments for AVERAGE function needs to be filled or entered i.e. =Average (Number1, [Number 2]…). Here, we need to enter the column range in Number1 argument, click inside cell C19 and you’ll see the cell selected, then Select the cells till C24. So that column range will get selected i.e. C19:C24. Click ok, after entering the column range. 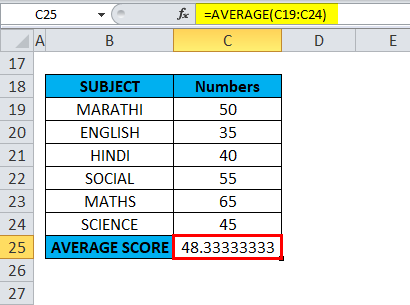 With the help of Average function, I need to find out average score of a student in that row range (F19 TO K19). 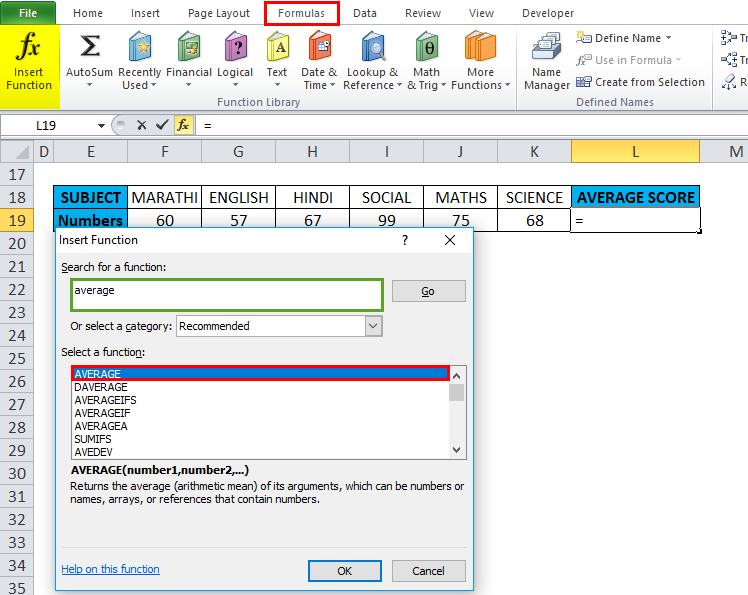 Let’s apply Average function in cell “L19”.Select the cell “L19”. where an Average function needs to be applied. Here, we need to enter Number1 argument, So, click inside cell F19 and you’ll see the cell selected, then Select the cells till K19. So that row range will get selected i.e. F19:K19. Click ok, after entering the row range. With the help of average function, I need to find out average time. Let’s apply Average function in cell “I10”. Select the cell “I10”. where the Average function needs to be applied. 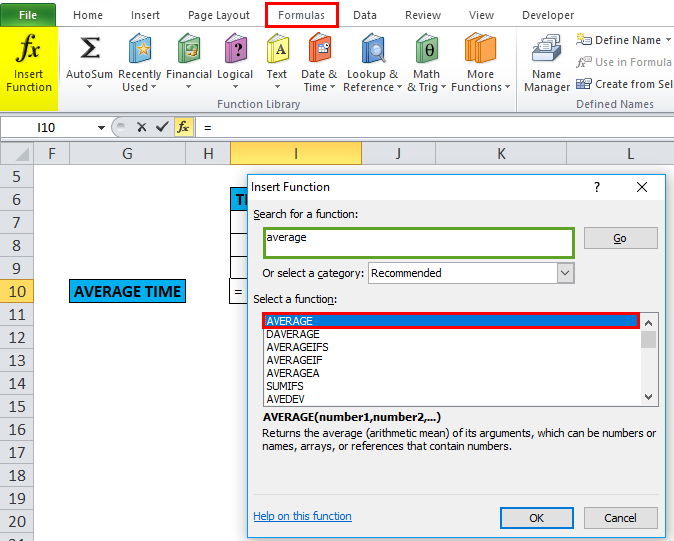 Click the insert function button (fx) under formula toolbar, a dialog box will appear, Type the keyword “AVERAGE” in the search for a function box, an AVERAGE function will appear in select a function box. Double click on AVERAGE function. Here, we need to enter Number1 argument, So, click inside cell I7 and you’ll see the cell selected, then Select the cells till I9. So that column range will get selected i.e. I7:I9. Click ok, after entering the column range. 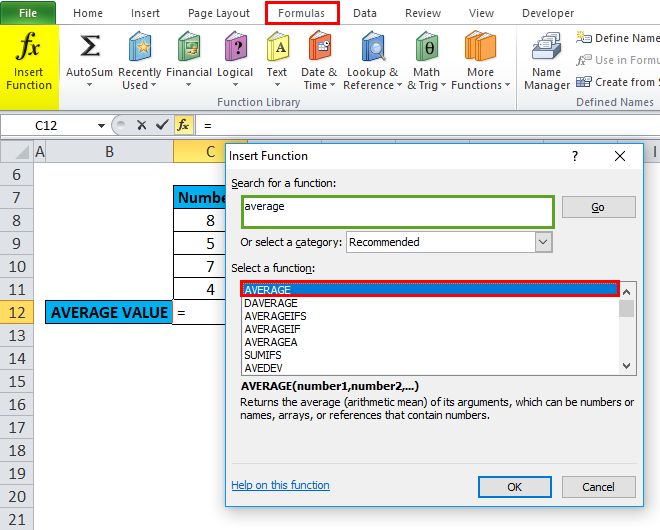 AVERAGE function is not restricted to find the average of a table range or row range or column range or non-adjacent cells. You can specify individual cells in number arguments to get the desired results. How to Use MID Function?